Today, tripods are made predominantly from two materials, carbon fiber and aluminum. Those looking to invest in a set of tripod legs will often have to choose between the two. This could have been a short post. Carbon fiber is clearly the better material from an engineering and design perspective. The why and how much better is the lengthy portion of this post. From a theoretical perspective, the choice to use carbon fiber over aluminum is well founded. The stiffness of a material is quantified by a metric called Young’s modulus. On that wikipedia page, the stiffness for carbon fiber is listed at 181 GPa while that of aluminum is 69 GPa. Thus, a carbon tripod with the same tube dimensions as an aluminum will perform much better. In addition, the carbon fiber is less dense than aluminum and will therefore the tripod will be lighter as well. This simplistic comparison is far from the whole story. In practice, carbon fiber tubes vary wildly in quality and stiffness. There are many factors that go into making a carbon fiber tube such as the direction of the fibers, the modulus of the fibers, and the resin/fiber ratio. For example, that same wikipedia page referenced in the above paragraph lists a different carbon fiber as having a modulus of 30-50 GPa, far less than aluminum. It is easy to save cost on the manufacturing side by having by using poor quality tubes while still being able to market the tripod as carbon fiber. Tripod manufacturers often list the number of layers of carbon fiber used in their tubes, but this to can be misleading and only has a small correlation with the final tube stiffness. There is a reason that none of the top manufacturers list the number of layers in their tubes. Its a meaningless measure. I know of no way to glean the quality of the carbon fiber tubes used in a tripod short of measuring the tripod stiffness as done on this site. There is vastly more to say regarding carbon fiber, such as the non-isotropic nature of the stiffness, and I likely will in a future post. For now, let us simply note that there is a huge variance in the stiffness of different carbon fiber composites. Below is a plot of the height adjusted stiffness versus weight for every tripod I have tested. This is simply a visual representation of the rankings page. The further up and to the left a tripod is on the plot, the better the score. In this plot though, the aluminum leg tripods are plotted in blue, and those with carbon fiber legs are plotted in red. The difference in performance is clearly apparent, with carbon fiber tripods performing much better than the aluminum ones. What is particularly interesting is that the aluminum tripods all appear to fall on a line, with the stiffness being roughly proportional to the weight. It appears that the old notion that stable tripods are necessarily heavy is correct when it comes to aluminum legs. 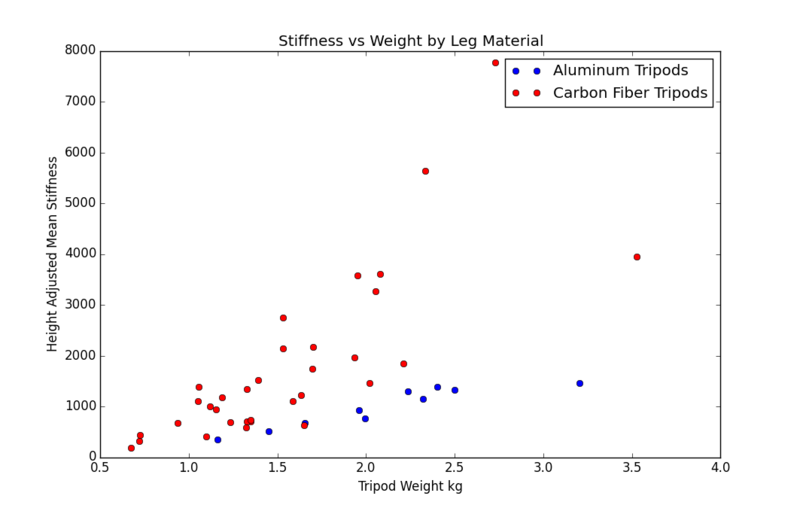 For carbon fiber legs, we see a lot more dispersion between the lowest and highest performing tripods at a given weight. This makes perfect sense given our understanding of the wide range in the quality of carbon fiber tubing. The best carbon fiber tripods are dramatically lighter and stiffer than an aluminum one. The worst ones appear to have similar stiffness to an aluminum counterpart while still maintaining weight advantages. Theoretically, carbon fiber also appears to have better damping than aluminum. Data for the damping ratio can be found for both aluminum and carbon fiber composite. The damping ratios for are better for the carbon fiber composites than for aluminum by a factor of between 1-3x depending on the sample of carbon fiber used and direction of vibration. Damping ratio depends on the stiffness and weight of the material. Carbon fiber is generally stiffer and lighter, and these would roughly offset each other in magnitude so the damping ratios should be somewhat comparable. Just be warned that we are doing some serious back of the envelope science here. Note that the damping figures reported on this site are not a ratio, but the absolute damping coefficient and are directly comparable to each other. Again, carbon fiber composite can be manufactured in many different ways, and we should naturally expect variance in the damping properties. 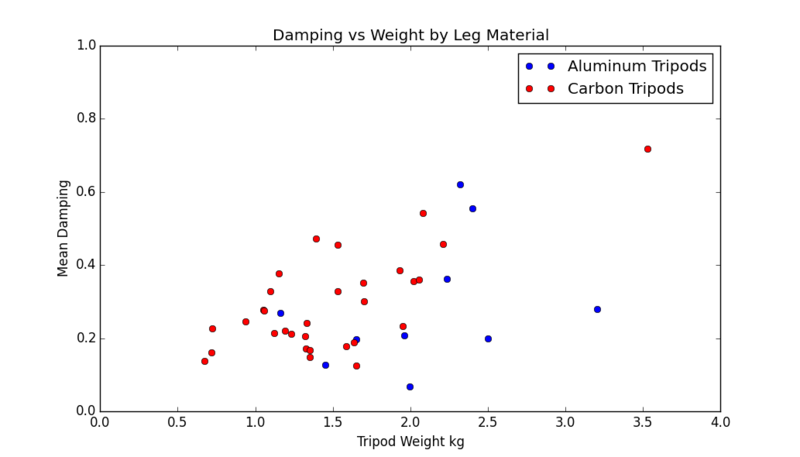 In summary, we should expect better damping properties from carbon fiber legs. With some expectations under our belt we can now take a look at the data. Below is a plot of the mean damping (harmonic mean of pitch and yaw damping) versus the tripod weight. The logic of this plot is less theoretically sound than that of the stiffness one, but is still useful. The carbon fiber tripods still appear to do better on average, but not dominantly so. As we have seen in previous posts, damping can behave in funny ways compared to the nice linear behavior of stiffness. In particular, it is easy to add a lot of damping to a tripod simply by varying the material of the top plate or engaging the set screws that hold the head in place. The damping inherent in the legs can therefore be dwarfed by other design factors of the tripod. Given that we have seen carbon fiber tripods with very low damping, I postulate that the leg materials contribute relatively little to the damping that we typically see in tripods. Carbon fiber does appear to damp better than aluminum though, as expected. In addition to analyzing the entire database of tested tripods, I have tested four sets of tripods that are identical except for leg material. These provide a much better control for our study. The measured specs for these tripods are listed below. As usual, the reported stiffness and damping are the harmonic mean of the measurements about the two axes. As you can see from the table, the carbon fiber tripods are roughly 20% lighter, with better stiffness, generally better damping, at just under double the price. There is significant spread between the pairs of tripods with respect the difference in stiffness and damping performance. For the Manfrotto MT tripods, the stiffness and damping is much better for the carbon versions, while for the Mefoto Globetrotter the stiffness is roughly the same and the damping is somehow worse. This disparity directly is almost certainly a result of the quality of carbon fiber used. The cheap carbon fiber tubes of the Mefoto are significantly lighter than their aluminum counterparts, but don’t actually perform better. The Manfrotto MT tripods have stepped up their game recently, and are clearly using higher quality tubes. This data set is inherently limited to tripods that have both carbon fiber and aluminum versions. All of the most expensive (and highest performing) tripods don’t come in aluminum versions. This denies us the direct comparison of how much better the best carbon tripods can be. However, the stiffness vs weight plot for all tripods above tells us that the performance of carbon is at least several times better. It is no mystery why those manufacturers looking to make the best possible tripods only use carbon. So far we have only focused on the performance aspects of carbon fiber and aluminum. There are other properties to these materials that affect the use of the tripod. Carbon fiber has much lower thermal conductivity than aluminum. Handling an aluminum tripod on a cold morning can be a truly uncomfortable experience and affect a shoot. The insulating properties of the carbon fiber can make this a non-issue. In a pinch though, so can leg wraps, but these further add to a tripod’s weight. Under severe stress, aluminum deforms while carbon fiber shatters. A bent tripod is still likely useful while a shattered one is not. If damage is a concern for your equipment, this may factor into your choice of material. Carbon fiber is clearly the better material for tripods. It simply performs at a much higher than aluminum, which was the previous material of choice. Aluminum still has a role to play for economical tripods. It is much cheaper and can be used to provide good value and build quality. If by the end of this article you are still trying to choose between aluminum and carbon fiber, you simply need to decide if the performance gains from carbon fiber are worth the additional cost. And remember, not all carbon fiber is created equal.